The Royal Canadian Mint introduces its newest release in an extremely popular program with the 2014 $20 Bobcat Silver Coin. This coin appears as the twelfth issue from the Mint’s Exchange $20 for $20 series which features 99.99% pure silver coins sold at their legal tender face values of $20. By Canadian artist Ken Ryan, the $20 for $20 Bobcat Silver Coin showcases a reverse design of a bobcat pouncing in the air. Behind it is a traditional Canadian scene. Inscriptions around the image read: 20 DOLLARS, ARGENT PUR FINE SILVER 9999, CANADA and 2014. Ryan’s initials of KR can also be seen. Obverses feature the Susanna Blunt effigy of Queen Elizabeth II with inscriptions of ELIZABETH II and D.G. REGINA. This coin features a mintage of 225,000. The first coin of the series had a lower mintage of 200,000, but it sold out quickly. Subsequent issues saw a higher mintage of 250,000 which helped in extending sellout times. Production was lowered to 225,000 for the last three program coins with sell outs for all but the most recent. That strike, released in January, showcases a Canada Goose. It is listed as 81% sold as of this writing. Each coin from the Exchange $20 for $20 program is struck to a weight of 7.96 grams and a diameter of 27 mm. The weight equates to just over one-quarter ounce of silver. This gives every coin in the program an approximate melt value of $5.44 based on the recent spot price of $21.25 an ounce. 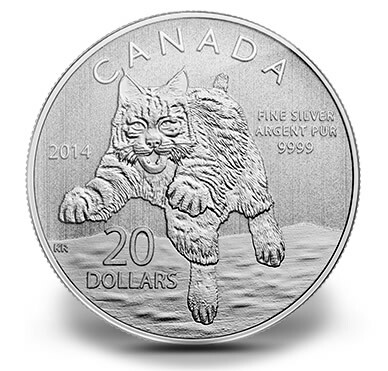 Ordering details and additional information about the 2014 $20 Bobcat Silver Coin is available on the Royal Canadian Mint website. 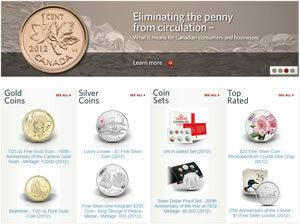 An affiliate link to the Mint’s page of $20 for $20 silver coins is right here . A household order limit of three is in place. Upcoming 2014 $20 for $20 Silver Coins are also available via subscription. Enrollees of the subscription program will receive the new coins as they are issued. It looks like it’s twin brother from the Canadian wildlife series…..
Its ugly…I like many of the designs they come up with but I feel they are mass producing coins with little thought that are just plain overpriced. 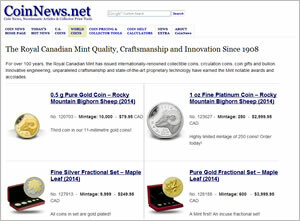 The US Mint continues to be a bargain compared to the RCM and other World Mints. While I agree with many of the critiques about this bobcat coin but I would much rather buy these silver coins than a 25 cent with a nice design on them that is only with 25 cents but being sold for $30+. Do the research. US mint wants $40.00 for this coin. Now who is more expensive. You need to go into the wild and actually see a Bibcat to appreciate this coin, obviously a city dweller.